Creating inclusive fiction with characters that come from different genders, backgrounds, races, and abilities is important. And one of the keys to doing so is crafting three-dimensional characters, not caricatures. Another key element is language: how to describe skin tone and facial features, whether to use person-first or identity-first language, how to identify and avoid bias language. And with character comes dialogue, and with dialogue comes the question of how to express dialect or accent without inducing cringes and flattening your character back down to stereotype. 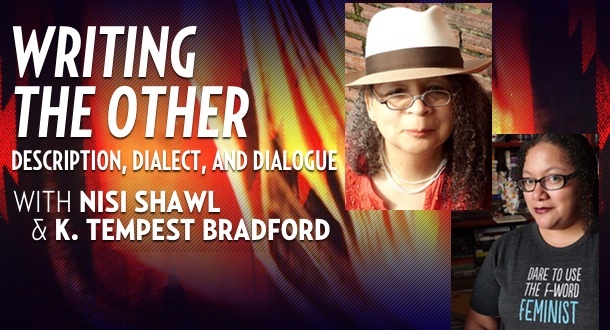 In this craft-focused class, authors Nisi Shawl and K. Tempest Bradford will guide you through these aspects of Writing the Other through lectures, hands-on exercises, and a wealth of resources for further study. At the end of these two weeks you'll have the tools to analyze and improve your own work. The week will focus on some of the fears writers have and pitfalls they encounter when trying to describe people who don't fit their dominant paradigm. You'll discuss bias language and how to identify it. In this week's exercises, students will work on describing people based on pictures, then move on to describing their own characters. This lecture will illuminate the various ways writers have depicted dialect or other non-standard speech in fiction and explain why certain approaches work or don't. You'll cover other dialogue considerations when writing the Other. In this week's exercises, students will use a short, live interview as the basis for putting these approaches into practice. *Both weeks will include lectures, writing assignments to be critiqued by your instructors and your peers, and plenty of opportunities for discussion along the way.